Abstract: This report describes an Arabian horse that was seen as a routine case to assess for signs of pain and or discomfort. On initial examination the horse was found to show signs of pain in the neck, back and pelvis. Treatment consisted of dry needling, myofascial massage and low level laser therapy. Electro-acupuncture will be used in future treatments. He responded well to this treatment plan and has since been moving better and is less painful compared to each previous visit. He continues to respond well to therapy. History: Snickers is used primarily as a pleasure horse and spends most of his days outside grazing with other horses. The owner did not report any history of obvious pain. He did, however, receive an injury to the left stifle at two years of age. This injury healed but his lameness, possibly originating from his injury, is still present. He may have developed further muscular and or anatomical problems after the injury or he may have developed other problems subsequent to that injury. The history is uncertain as the current owner purchased him about four years after the trauma to the stifle. Since being with the new owner he has been lame on the left hind limb and this has been managed with phenylbutazone orally every other day, with periods of weaning him off of it. When he is weaned off this drug the owner reports that he becomes lame on the left hind limb. He has never had any type of integrative medicine treatment prior to this one. 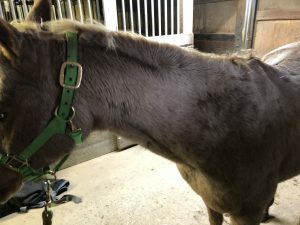 The saddle that he currently uses is not appropriate for him and thus his owner is working on getting his saddle resized, as this has not been done in some time. Snickers is up-to-date with his vaccinations and deworming program. On presentation, Snickers appeared bright, alert and responsive. Physical examination on initial visit: Heart rate was 30 beats per minute, respiratory rate was 12 breaths per minute, mucous membranes were pink and moist, and gut sounds were normal in all four quadrants. He weighed approximately 900 lbs. There were no abrasions or injuries present at the time of his initial examination. He appeared to be healthy based on the physical examination. On further examination, he was found to have pain over the temporomandibular joint (TMJ) area of his face, which appeared to be more significant on the left side as compared to the right side. His neck also appeared to be painful, more specifically in the area of C2 – C3 on the left side. On further palpation of the neck region he was found to have a trigger point (felt like a tension band ) also over the transverse processes of the C2 – C3 vertebrae on the left side of the neck. There were signs of pain over the withers with the left side being worse than the right. He appeared to be off-loading his left hind limb as evident by his left hip being higher than the right. It was also difficult to get him to stand “square”. He tended to place the right hind limb more cranial than the left. There were signs of pain during the myofascial examination over the lumbosacral region as well, primarily involving the area from L2 – S1 with the left side being worse than the right. Neurological examination did not find any deficits or any significant findings. Problem list: TMJ pain, neck pain, pain at the withers, as well as pain over the lumbosacral area. The areas found to be painful, as reported above, were bilateral with the left side being worse than the right. Off-loading on the left hind limb with some mild muscle atrophy of the right gluteal muscles was also present. Osteosarcoma, while uncommon in the horse can cause the signs seen in the painful pelvis. A poorly fitting saddle could be causing much of the discomfort experienced by the horse. Chronic pelvic pain causing increased strain or tension on the neck muscles and thus causing pain in the neck. While there may be a congenital component to his pain, it is unlikely since he is now 12 years old with no history of early problems. There is the possibility of trauma that caused his pelvic pain. He is housed mainly outside with other horses, so he may have been kicked by another horse, had an awkward step or jump, or he fell without it being observed. Given his history of trauma to his left hind limb, this can likely contribute to the pain in his pelvis. Poor hoof conformation and or shoeing can lead to pelvis and lumbosacral pain. Pain in the oral cavity can contribute to or even lead to lumbosacral pain. This may occur due to inappropriate carriage of his head if he is trying to avoid a bit or if there is the presence of oral pain causing him to position his head abnormally and thus putting more tension on his neck and back. Myositis due to an autoimmune condition could also be responsible for the painful pelvis. Pelvic and lumbosacral pain is likely due to poor conformation of the pelvis as well as the injury to his left hind limb which may have been responsible for an acute painful response in the pelvis which has now become a chronic problem. The neck and shoulder pain appears to have been as a result of the pain from his pelvis and also possibly due to the use of an inappropriate saddle. The initial visit (10/24/2018) consisted of a full physical examination as well as a myofascial palpation. 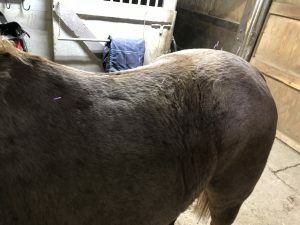 This horse had never received acupuncture treatment and the decision was made to start with a myofascial massage to get to know the horse and at the same time provide some relief in the painful areas. Massage of the affected areas, as stated above, was performed and the owner was taught how to do this as well. During the treatment he did yawn a few times. He appeared much calmer as his eyelids closed and his head would drop like he was very relaxed and almost sleeping at some points. There was one point where it was very clear that he was enjoying the massage as his behavior changed from being head up and looking around to be totally calm and relaxed. Palpation of the TMJ on the left side caused him to move away. The left neck was still painful in the area of C2 – C3 primarily, with a trigger point also palpated in this area. He was hesitant to abduct and adduct the left fore limb. There was an indication of pain at the withers on both left and right sides, as he tried to move away, he swung his head around to look at what was being done. There was also pain along the left inner bladder line (between the longissimus and ilicostalis muscles), with the left side being more painful than the right side. He reacted during the myofascial examination along the area around the caudal lumber vertebrae L3 – L6. Snickers was also once again off-loading the left hind limb. Baihui – this point was used to balance the autonomic nervous system by allowing more of a parasympathetic response and thus reducing the amount of sympathetic stimulation that was present. GV 20 was used as a calming point for the horse. This was used to calm the horse as it is believed to be a nice way to introduce acupuncture to the horse and help reduce the amount of sympathetic tone that is present. ST 36 is an autonomic and a very beneficial point as it affects the neurological function of the limbs and also communicates with the nucleus tractus solitarius. It can also be a stimulating point so the decision was made to delay using this point until the following treatment. Acupuncture points used at this treatment included the following: LI 16, BL 10, 11, 13, 21, 23, 25, 27, 28, SI 11, 12, GB 21, these were all done bilaterally. Seirin needles 0.25 x 30 mm were used. These points targeted the areas where pain was detected during the examination. Needles were placed in the neck, thoracic, lumbar and pelvic regions to cause neuromodulation and thus provide pain relief to the horse. 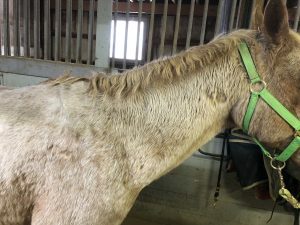 The owner reported that after this treatment the horse had improved mobility the same day. He also moved better the following day when the owner was riding him. He was still a bit resistant to moving his shoulder to the left. The horse was, however, moving his hind-end better and stepping up underneath himself more than prior to the treatment. The client continued to massage the horse’s neck and the thoracolumbar area once a day three times a week. No pain was found in the cervical or head area as compared to what was found previously. He was still painful at L3 – L6, and Snickers was found to be still off-loading on the left hind limb. It was still difficult to make him stand “square”, as his right hind limb would keep moving slightly forward (as seen in the pictures). Acupuncture treatment was performed at the following points: GV 14, 20, Baihui and at these following points bilaterally: SI 11, SI 12, LI 16, BL 10, 18, 18a, 21, 23, 25, GB 29, 30. Seirin needles were used at all the points listed above except for GV 20, at this point a seirin 0.16 x 15 mm needle was used since the tissue here is a lot thinner and more sensitive compared to the other points that were acupunctured. A class 2 handheld laser device was used to perform low level laser therapy in the neck and pelvic regions where trigger points and reactive areas were found during the myofascial examination. Photo-modulation helps the tissue to heal and also reduce the tension in the muscle, which reduces pain in the area. On 11/26/2018 the owner reported that he was a lot more active. He was running and more interactive. Snickers, however, was still painful in the lumbosacral region and electro-acupuncture will be used at his next treatment. This will increase stimulation at the points used and help improve healing and decrease the amount of pain the horse is experiencing. 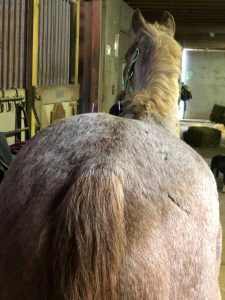 While his previous injury was to the left hind limb it was expected that he would be more painful in the contralateral side in the head and neck region, if this was the cause of his initial pain incident and chronic pain. This horse, however, was more painful in the left head and neck area at the initial examination. He was found to be off-loading the left hind limb again indicating that he would likely be more painful in the right neck region but this was not found to be true. It is speculated that due to the chronic pain and with more weight being placed on the right lumbosacral area that he would therefore be more painful in the left neck area which was true in this case. Snickers’ hind limb lameness was somewhat controlled with his phenylbutazone but the chronic use of this drug is not the best solution. 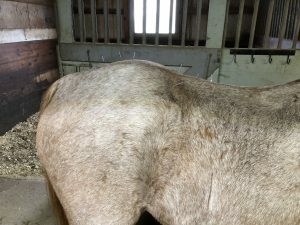 The different modalities of integrative medicine used in this case helped provide some pain relief for this horse. After the third visit, his lumbar and sacral pain were still present but the pain in his neck and at the withers had improved significantly. The points used in this case were focused on areas where pain and trigger points were detected on the physical examination. These points consisted of areas of the neck and primarily along the inner bladder line. As treatment progressed autonomic points were added in, such as ST 36, which helped increase parasympathetic response. This reduces the sympathetic response that can be seen with wind-up pain and helps the patient feel more relaxed and also allows the muscles to relax, thereby producing pain relief for the patient. Low level laser therapy has also been shown to be very beneficial in patients with pain and this modality was used at the third visit along with dry needling specific points, as well as with trigger points that were found during the examination. The horse has shown steady improvement. It is believed that with continued use of integrative medicine techniques this horse can show significant improvement and hopefully live a better, more pain free life. Bush JM, Fredrickson RL, Ehrhart EJ. (2007) Equine Osteosarcoma: A Series of 8 Cases: Case Report. Vet Pathol. 44(2): 247-249. Clayton HM, Hampson A, Fraser P, White A, Egenvall A (2018) Comparison of rider stability in a flapless saddle versus a conventional saddle. PLoS One, eCollection. 6;13(6). Durward-Akhurst SA, Valberg SJ. Immune-Mediated Muscle Diseases of the Horse (2018) Vet Pathol. 55(1): 68-75. Pellegrini DZ, Müller TR, Fonteque JH, de Souza LP, Souza A, Joaquim JGF. (2018). Equine acupuncture methods and applications: A review. Equine Veterinary Education. 10.1111/eve.12928. Pinar A, Asheesh G, Magesh S, Daniela V, Zeev P, Nadav P, Michael RH. (2013) Low-level laser (light) therapy (LLLT) in skin: stimulating, healing, restoring. Semin Cutan Med Surg. 32(1): 41–52. Xie H, Colahan P, Ott EA. (2005) Evaluation of electroacupuncture treatment of horses with signs of chronic thoracolumbar pain. J Am Vet Med Assoc. 227(2):281-6.